Rick Deckard is the jaded, world-weary police assassin who is tired of his gritty job, but has been arm-twisted out of retirement for one last special assignment. 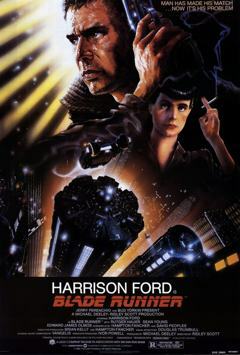 It is a sensitive case in which five replicants have hijacked and destroyed a shuttle in the process of smuggling themselves into earth space, and are now on the run as fugitives. Deckard’s undercover mission is to hunt down and ‘retire’ the replicants before the public becomes aware of their presence. For Harrison Ford, this is a very different (but convincing) role than the usual self-assured, charismatic, wise-cracking rogues such as Indy Jones or Han Solo. Instead, Deckard is a conflicted, awkward, almost sleazy, cynical and damaged man as befits the nightmarish future in which the movie is set. Deckard: [narrating] They don’t advertise for killers in the newspaper. That was my profession. Ex-cop. Ex-blade runner. Ex-killer. Deckard: [narrating] Sushi. That’s what my ex-wife called me – cold fish. Deckard: [narrating] The report read “Routine retirement of a replicant”. That didn’t make me feel any better about shooting a woman in the back. Deckard: I have had people walk out on me before, but not… when I was being so charming. Deckard: [narrating] I don’t know why he saved my life. Maybe in those last moments he loved life more than he ever had before. Not just his life – anybody’s life; my life. All he’d wanted were the same answers the rest of us want. Where did I come from? Where am I going? How long have I got? All I could do was sit there and watch him die. Deckard: [narrating] Gaff had been there, and let her live. Four years, he figured. He was wrong. Tyrell had told me Rachael was special. No termination date. I didn’t know how long we had together… Who does? Brigitte Helm as Maria in Metropolis: "HEAD and HANDS need a mediator! The mediator between HEAD and HANDS must be the HEART!!"